When I first went vegan eight years ago I didn’t know anyone vegan or even vegetarian. I initially went vegan to improve my health after reading Alicia Silverstone’s book, The Kind Diet, which I highly recommend. In her book Alicia offers a funny and easy approach to adopting a vegan diet. Back then book shelves were not stocked with hundreds of vegan cookbooks like they are today. I read a few blogs to help guide my path, but basically I was out here winging it on my own. An avid fan of the Food Network for kitchen inspiration, I was disappointed to find then, as in today, no vegan shows existed. Yet over time with some trial and error I learned how to sub out animal products in recipes and make them plant-based. It’s a fun challenge for me to take a scrumptious animal product recipe and successfully turn it plant-based. It helps there’s a plethora of animal replacement products on the market too. Such in case the recipe I’m sharing with you today. I recently saw this on a non-vegan cooking show and knew in a split second I was making it vegan. Now ya’ll know I love football and brunch, which makes for a winning combo when it comes to tailgating. The food I serve needs to be easy to prepare, serves a crowd, and sometimes portable. This strategy leaves me time to enjoy the company of friends, the game, and drink more Mimosa’s. 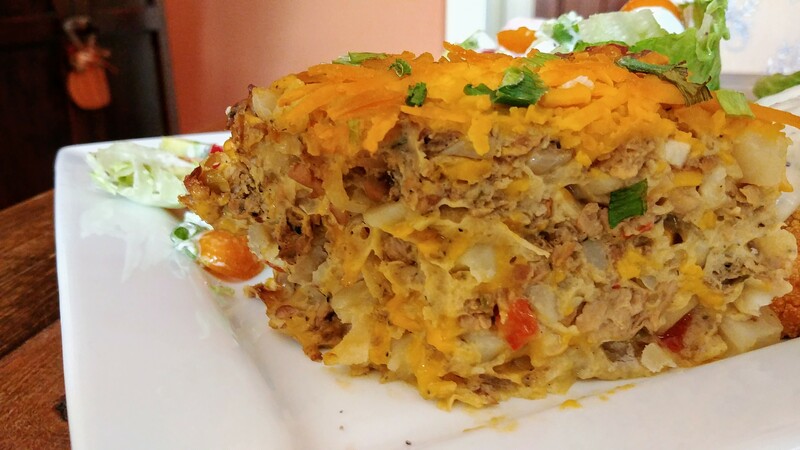 This casserole certainly fits the bill. I love proving animals do not have to suffer for us to enjoy delicious food or wearing fashionable products. Give this casserole a try at your next gathering, whether is’s a tailgate or to guest during the holidays. You won't believe how easy this casserole is to put together. Assemble it the night before and leave yourself more Mimosa time in the morning while it bakes. Leftovers make good taco or burrito fillings too. Add the sausage to a medium saute pan. Cook over medium-high heat until browned, crumbling the sausage with a spoon while it cooks. Remove the sausage with a spoon and transfer to a large mixing bowl. Add 1 tablespoon of oil to the saute pan. Add the onion and red pepper to the saute pan, and saute for 5 minutes until cooked. Add the garlic and saute for an additional 2 minutes. Pour the vegetable mixture into the mixing bowl with the sausage. Add the hashbrowns and 1 1/2 cups of the cheese to the mixing bowl with the sausage and veggies. Stir to combine. In a separate bowl, whisk together the vegan eggs (made per package instructions), milk, and black pepper until combined. Then add them to the hashbrown mixture and stir to combine. Pour the mixture into a 9x9-inch baking dish, and top with the remaining 1/2 cup of shredded cheese. Cover with aluminum foil and bake for 20 minutes. Then remove the aluminum foil and bake for an additional 10-15 minutes until the top of the potatoes begin to lightly brown. Remove and let the casserole rest for 5 minutes. Sprinkle with green onions and serve!